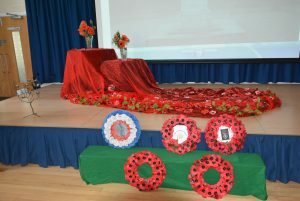 “On Thursday, 8th November, the whole school had a Remembrance Day Assembly and Year 6 performed a play. 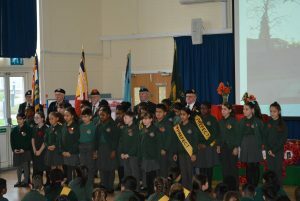 Those who came included the Colour Party, our Choir, parents and a trumpeter. 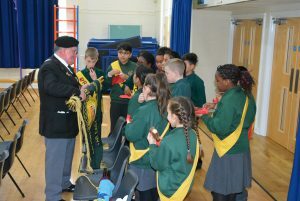 At Leagrave Primary School, we are committed to teaching and promoting the importance of the Fundamental British Values. We recognise the fundamental role these values play, in every child’s spiritual, moral, social and cultural development. These values are taught and developed in our values, RE and PSHE lessons, as well as through assemblies and our daily interactions and ethos in the school community. At our school, pupils are listened to carefully and are taught to listen to one another. Children are taught to respect the rights of others, as well as have their rights and opinions respected. Our students’ voice and opinions are promoted through our school learning council, which gives pupils a forum to share these opinions with the senior leadership team (SLT). We value the opinions of our pupils and we recognise that by allowing their views to be heard they can take greater ownership of their learning. At the start of each academic year, a school council representative is elected from each class based solely on pupil votes, reflecting our British electoral system and highlighting democracy in action. School councillors play a vital role at our school and are expected to attend regular meetings in their lunch times to discuss whole school issues and support in assemblies. School councillors represent their classes and act as a link between staff and pupils. Most recently, our school councillors developed an anti bullying leaflet. Our children recognise the impact of bullying and they share our zero tolerance policy on bullying behaviours. In addition to the school council, we also promote democratic values through our annual pupil survey. The survey provides children with the opportunity to share their views on their class and their learning. The results of the survey are then analysed, reflected upon and acted upon accordingly. Learning right from wrong and understanding the consequences of the choices we make, is a fundamentally important learning journey. At Leagrave Primary School, the behaviour of our students is excellent and they are regularly praised and rewarded for making positive choices, through verbal feedback as well as house point tokens and gem stone certificates. These are shared in a weekly rewards assembly where children’s achievements are celebrated in their phase groups. During this time, children who have produced outstanding work that week will be asked to share it. In addition to this, they are encouraged to reflect upon poor choices. This is outlined in our school’s behaviour policy. In addition to reflection opportunities in time out, children in KS2 are encouraged to attend ‘Positive Moves’ club. This is a chance for children to consider their recent behaviour choices and develop strategies to support them in making positive choices moving forward. As well as promoting the rule of law through our curriculum and ethos, we also have regular visits and talks from the emergency services and local councillors. This allows the children to ask, first hand, their questions. Children can see how the choices they make impact on their wider community. Leagrave Primary School is committed to their role in abiding by the rule of law and safeguarding. All adults who work and support in the school are responsible for following and adhering to the school’s safeguarding policies. We invest a great deal of time in creating a positive ethos in our school, so that all members of our community are in a safe environment where choices and freedoms are encouraged. In lessons, learning objectives are routinely used to give students the opportunity to set themselves personal challenges. This is also highlighted through our school’s mission statement “Striving for Excellence, Learning for Life.” We encourage our students to aim high and to choose the task that will challenge them, giving them more freedom to determine their own learning. Pupils are constantly encouraged to make choices, knowing that they are in a safe and supportive environment. As a school we educate and provide boundaries for all pupils to make choices safely, through provision of a safe environment and an empowering approach through the education. Pupils are encouraged to know, understand and exercise their rights and personal freedoms and are advised how to exercise these safely. At the beginning of the school year, all classes create their own class rules. These are in addition to the school’s golden rules. Each class decides what rules they think are important to them, this is then drawn up as a contract and signed by all pupils. It can then be referred to throughout the year and children know that they are the rules that they agreed on. One way that we demonstrate the fundamental value of individual liberty, is through running our classroom suggestion boxes. There are linked directly to our school learning council. Children can feel free to write down any suggestions that they feel would improve the school. Suggestions that have already been taken in to account and acted upon include introducing art and plants to classrooms and corridors to brighten them up. Children are taught to be proud of their heritage and culture, whilst also appreciating and tolerating others. Children understand that they have the individual liberty to follow any faith that they wish. As a school which holds values at the core of its ethos, our Behaviour policy has evolved around our golden rules and appreciation of respect as a core value. Pupils have been part of discussions and collective worship related to what this means and how it is shown. Respect is one of our values taught within lessons, collective worship and penetrates the ethos of the school It is shared with home through newsletters and website information. Adults throughout the school model, demonstrate and promote respect for others as do older children who have suitable, age related, tasks and responsibilities and this is reiterated through our classroom and learning rules, as well as our behaviour. Celebrating a range of religious festivals; Diwali, Christmas. Here is some of our work to celebrate Queen Elizabeth’s reign.